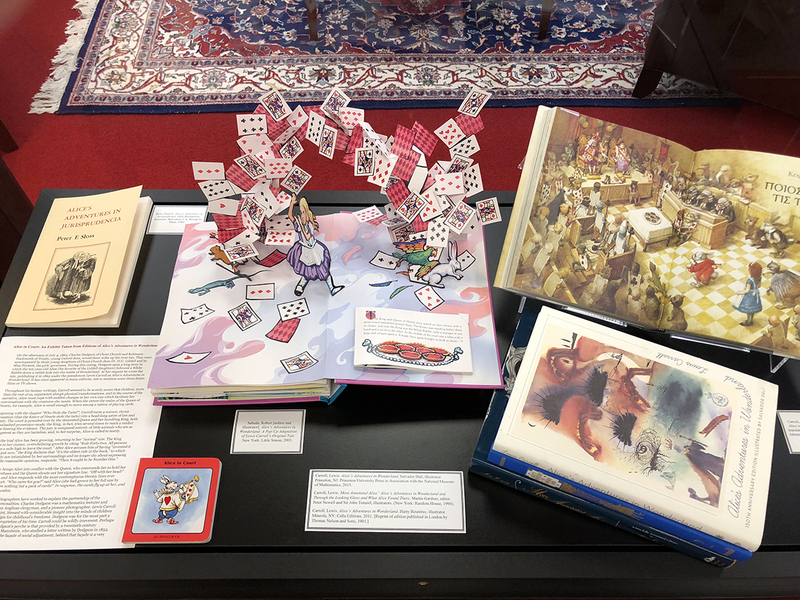 Take the opportunity to visit our exhibit “Alice in Court” located in the main hall of UA’s Law Library before it is replaced. The following post, “Alice in Court,” seeks to describe the legal aspects of one of the world’s great fantasy stories–Alice’s Adventures in Wonderland by Lewis Carroll. 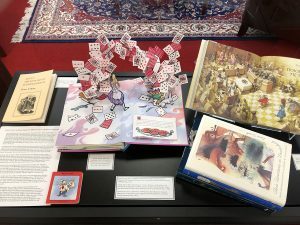 The exhibit includes works in a Lewis Carroll collection assembled by Litera Scripta co-editor Paul M. Pruitt, Jr.
On the afternoon of July 4, 1862, Charles Dodgson of Christ Church and Robinson Duckworth of Trinity, young Oxford dons, rowed three miles up the river Isis. They were accompanied by three young daughters of Christ Church dean Dr. H.G. Liddell and by Miss Prickett, the girls’ governess. By most accounts it was a golden afternoon. Certainly it was golden for Dodgson—for in the course of rowing and picnicking he spun a long story in which the ten-year-old Alice (his particular favorite) followed a White Rabbit down a rabbit hole into the realm of Wonderland. At her request he wrote and rewrote the tale, publishing it in 1865 under the pseudonym Lewis Carroll as Alice’s Adventures in Wonderland. It has since appeared in many editions, not to mention some three dozen films or tv shows. Carroll’s purpose, to be sure, is to entertain, yet his Alice must deal with a series of animal and human characters who are self-willed, indifferent to her well-being, even dangerous—just like certain types of people who inhabit what we are pleased to call the real world. At the same time Alice’s new acquaintances may be poignantly bizarre, relentlessly and wrong-headedly logical, and (more often than not) determined to recite poetry or hear it recited. Beyond the inspired nonsense that Alice hears and speaks, there are grown-up dimensions to several of these encounters. Many of Carroll’s episodes summon up topical issues (of law, psychology, and social class, among others) that are very much alive today. It was Carroll’s genius to place the challenging scenes of Wonderland in a dreamlike setting and to seed his story with rollicking puns, jokes, and verses. All of these elements are heightened by Alice’s childlike candor and inquisitiveness. The story is told from her perspective, which allowed Carroll to make excellent use of the “real” Alice Liddell’s independent-minded personality. Surely, Carroll was a pioneer in following a child’s path through a satirically informed world. Mark Twain (another pseudonymous writer) would not perfect his master creation, Huckleberry Finn, for another twenty years. Alice’s subsequent changes of size facilitate her conversations with the creatures she meets. Thus we see Alice at three inches tall discussing questions of identity (“Who are you?”) with a hookah-smoking caterpillar, who as he crawls away, tells her that “One side will make you grow taller and the other side will make you grow shorter.” Reading her thoughts, he adds that the “sides” in question were those of the mushroom on which he had been sitting. Soon after, Alice talks with a Cheshire Cat, whom she had already met in the Duchess’ kitchen. She resists his assertion that “we’re all mad here,” admires his ability to disappear in whole or in part, and follows his directions toward the March Hare’s neighborhood. There she takes a seat at the Mad Tea Party, probably the book’s most referenced scene. Finally, amidst a sea of puns and logic-jokes, The Hatter laments that Time, once and potentially his ally, has turned against him. This state of affairs had been in place ever since the Queen of Hearts heard the Hatter sing “Twinkle, Twinkle, Little Bat” and accused him of “murdering the time.” Time, apparently, is on the Queen’s side. Next Alice, now a foot tall, plays flamingo-croquet with the Queen of Hearts, ruler of a nation of live playing cards. Even more than the Duchess, she is an embodiment of violent anger: abrupt, heedless, retributive, utterly privileged. Those who incur her wrath are lucky if they are merely cast in prison. Others are sentenced to decapitation, though we’re given to understand that none are actually executed. The Queen herself effects Alice’s escape from these Carrollian scenes of humor and horror, instructing a nearby Gryphon to take Alice to meet a Mock Turtle. Alice hears his “history,” which turns out to be a tale of being educated under the sea—where he studied, among other things, basic literacy (reeling and writhing) plus the branches of arithmetic: ambition, distraction, uglification, and derision. After further singing, dancing, and nonsense verse, Alice and her new friends are summoned to witness the book’s final Wonderland event, the trial of the Knave of Hearts. Up to this point, Carroll has mocked, more or less slyly, several Victorian standbys: the dignity of leaders, the notion of polite society, homilies upon child-rearing, the wisdom of elders, the benevolence of the ruling classes. Beginning with the chapter “Who Stole the Tarts?” he turns a nursery rhyme accusation (that the Knave of Hearts stole the tarts) into a head-long satire of law and society. The court is presided over by the demented Queen and her bumbling King, both in unabashed prosecutor-mode; the King, in fact, tries several times to reach a verdict before hearing the evidence. The jury is composed entirely of little animals who are as incompetent as they are harmless—though that does not save two boisterous Guinea Pig jurors from being “suppressed” by court officers who toss them in canvass bags and sit upon them. The first witness is the Mad Hatter, tea cup in one hand and bread-and-butter in the other, miserably cowed by the prospect of appearing before the Queen. The King’s command: “Give your evidence, . . . and don’t be nervous, or I’ll have you executed on the spot” does nothing to improve his morale. The cards fly up at her and she wakes. Lewis Carroll, Alice’s Adventures in Wonderland, and Through the Looking Glass and What Alice Found There, introd. by Tan Lin (New York: Barnes & Noble Classics, 2004), 35. Hereinafter Alice. Alice, 37. For more examples of “Darwinian” poetry in the Alice books, see ibid., 121, 194-195, for “Tis the Voice of the Lobster,” and “The Walrus and the Carpenter.” For discussion of “Fury Said to a Mouse” see Gilliam Beer, Alice in Space: The Sideways Victorian World of Lewis Carroll (Chicago: University of Chicago Press, 2016), 194-196. Alice, 71. There was in late Victorian England a market for such mock-horrifying humor. Consider the popularity of the “Little Willie” rhymes, enshrined in D. Streamer, Ruthless Rhymes for Heartless Homes (London: E. Arnold, 1899). One has only to google “Mad Tea Party” to grasp the likely truth of this assertion. Alice, 79-82. For a selection of possible answers to the Raven riddle, see Lewis Carroll, The Annotated Alice: Alice’s Adventures in Wonderland and Through the Looking Glass, Martin Gardner, ed. (New York: Bramhall House, 1960), 95-96, n. 3; and Lewis Carroll, More Annotated Alice: Alice’s Adventures in Wonderland and Through the Looking Glass and What Alice Found There, Martin Gardner, ed (New York: Random House, 1990), 83 n. 4. Alice, 82-83. For a sophisticated analysis of Time and Alice, see Beer, Alice in Space, 27-43, especially 38-41. For Beer’s assessment of other themes discussed in this post, see also 173-208 (especially 192-208), 209-244. Alice, 129-130. The King threatens the Hatter with execution three times in the span of two pages, while the Queen, who has been staring at him, asks for a list of singers at the last concert. The Hatter shakes so much that his shoes fall off, and he eventually flees from court without them. Note that, encumbered as he is with tea-time food, he is still a participant in the endless tea party. Ibid., 138 ff. Also quoted in Beer, Alice in Space, 204, 206-207. See Derek Hudson, Lewis Carroll (London: Constable and Company, 1954) and Morton N. Cohen, Lewis Carroll: A Biography (New York: Knopf, 1995), among others. Quoted in Hudson, Lewis Carroll, 66.